Abstract: JSON.NET is a great framework for working with JSON data. We will perform JSON Serialization and Deserialization operations and query data using LINQ. JSON is not natively supported by .NET, so when we are developing applications using a .NET language like C#, it is important to make use of JSON.NET. JSON.NET is a high-performance JSON framework for .NET. We can download JSON.NET via the NuGet Package Manager with Visual Studio. In this article, we will use Netwonsoft.Json package to work with JSON Serialization and Deserialization operations using LINQ. The application is implemented using Visual Studio 2015, but this sample can be developed with Visual Studio 2013 too. Step 1: Open Visual Studio and create a Console Application with name as JSON_LINQ_TOJSON. In this project, add Netwonsoft.Json using NuGet Package Manager. Right-click on the project name and select Manage NuGet Packages, this will open the NuGet Packages Windows, search for Netwonsoft.Json and install the package. Step 2: In the project, add a new class file with name as ModelClasses.cs and add the following code into it. The above class defines a Student class containing the Course list in it. The StudentsDatabase stores some values in it. This also has an Employee class with EmployeesDatabase and some predefined values. The above code has the following behavior. 1. 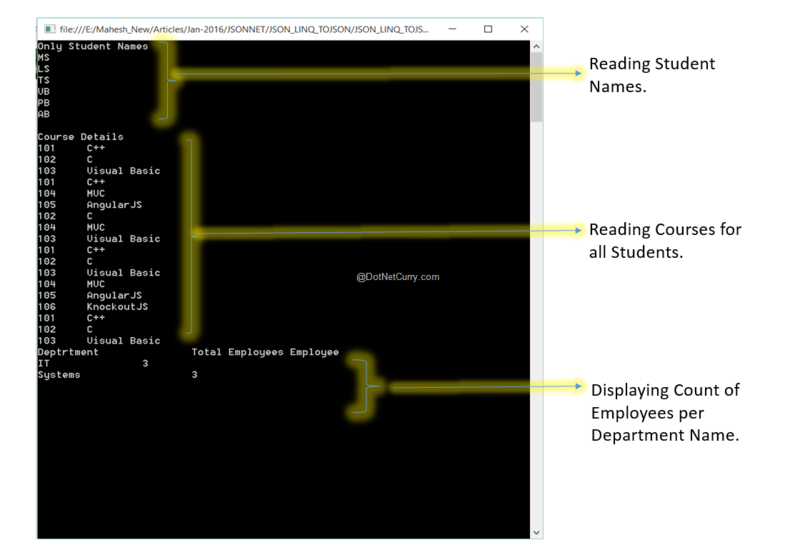 Using JsonConvert.SerializeOnbject(), serialize the StudentsDatabase in JSON format. 2. Using JArray.Parse, store Student Data in JSON array. 3. Fire the JSON to LINQ Query to read all Student Names. The query specifies the name of JToken in . E.g. s[“StudentName”]. 4. The JSON data has Students which has Courses as Child array for one-to-many relationship. 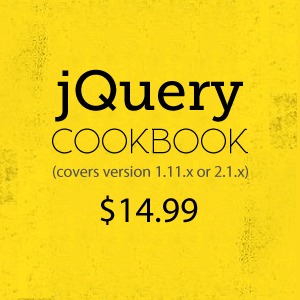 To read this the query use the Children() method of the JToken collection and read all Courses. The Course data is displayed on console by converting each JToken into the Course object using ToObject<T> generic method, here T is the name of the class in which JToken will be converted. 5. As explained in point 1, the Employee data is serialized into JSON string. 6. The Employee data is parsed into JArray. 7. The query is fired to calculate the Count of Employees in each department using GroupBy Caluse. As we saw, JSON.NET offers an excellent approach for working with JSON data using LINQ support.